What on Earth Books, 9781999802851, 36pp. From award-winning illustrator Guillaume Duprat, children will see exactly how animals view the world around them in this innovative and exciting lift-the-flap book. Ever wonder what your cat is watching through the window? Or how having eyes on the sides of its head changes the world for a horse? And what would life be like seeing in 5 colors instead of only 3? 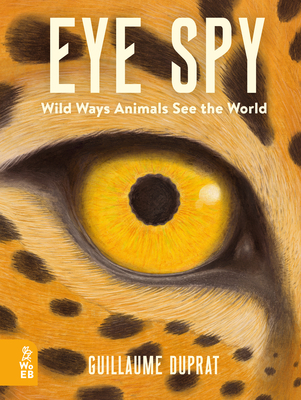 After a whirlwind tour of how eyes work, children will lift the flaps to find out how animals as different as dogs, owls, and chameleons see the same scene.EYE SPY: Wild Ways Animals See the World is a truly eye-opening experience guaranteed to fuel and satisfy the curiosity of any animal lover.